Last Sunday marked the 39th Anniversary of that fateful Roe v Wade decision…but Monday also marked the start of the 40th year of legalized abortion in America. It also means that approximately 54 Million (54,000,000) preborn children have been slaughtered in the name of convenience since 1973. 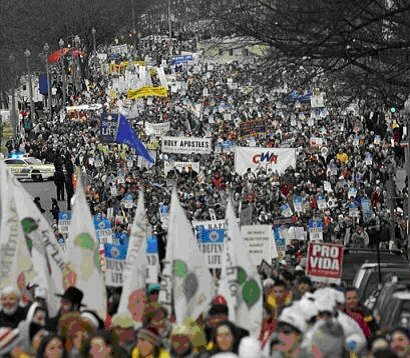 On Monday, Jan 23rd, close to 500,000 people gathered in Washington DC to mark this historic anniversary. Why is it historic? Remember that the Israelites spent 40 years in the wilderness, wandering in the desert, because of their lack of faith in the Lord. But they only wandered aimlessly for 38 years; for the last 2 years they were just outside the Promised Land, preparing to go in and take the land that their Lord and Creator promised them. If you look back over the past 12-18 months, there is no mistaking the move that God is making, and the blessings and victories that He is brining to the Pro-Life movement. Just today, Susan G Komen just cut ties with Planned Parenthood – that’s about $600,000 a year! And today, 40 Days for Life announced that the 21st clinic where a 40 Days for Life campaign was held, is CLOSING – for Good! Could this be the preparation time before we enter the Promised Land? Preparation to re-establish a land in which children are not sacrificed on the alter of convenience? It has never been more critical for us to remain in prayer, and we must not rest. We must remain vigilant, and step up our actions in the public square! Let’s seize the chance we have been given right here in our own state of Maryland. On January 13th, the Department of Health and Mental Hygiene published formal draft regulations for abortion facilities – the first in Maryland’s History! The regulations are not yet finalized. The Department of Health and Mental Hygiene needs to hear from you today in order to guarantee pro-lifers have their voices heard in this process! Please use the talking points below. It is important to acknowledge the significance of this change in policy and give applicable comments to the process. Points 1-3 do this effectively, while Points 4-5 reflect thoughts for DHMH to keep in mind for the future. Send DHMH your personalized email today! Click here to begin! 1. You thank viagra drug interactions them for drafting the regulations. After 20 years of waiting, DHMH’s drafting of and support for fundamental regulations for abortion facilities is long overdue. 2. It makes perfect sense to use the ambulatory surgical facility regulations as the basis for these regulations, as abortion is an invasive surgical procedure with risks similar to other invasive surgical procedures. 3. The regulations overall, particularly the section on use of anesthetics, represent a necessary step in the right direction. We appreciate seeing DHMH acknowledge that women have died or were seriously injured in abortion facilities over the past 19 years. 4. As a next step, women need to be told the truth about the dangers of abortion if they are going to give real, informed consent before this procedure. Abortion is an invasive procedure which has been proven to result in death, permanent infertility, cancer, post abortion syndrome, and many other tragic physical and psychological complications. 5. Most importantly, women need to be told the truth about what and who they are destroying during an abortion. Real informed consent involves being given the facts about unborn children and what an abortion does to them. Don’t miss a FREE Pro-Life lunch tomorrow, Wednesday February 1, at Shady Grove Presbyterian Church in Gaithersburg. The lunch will start at noon, but there will be a prayer gathering starting at 11:30am. We invite everyone to join us to hear the amazing things that are going on in MD, and around the country…and what we all need to do cross the finish line this year! 180 Movie – Will You Make a 180? hey there, truly interesting posts you make, just keep up the great work, will be back for more!